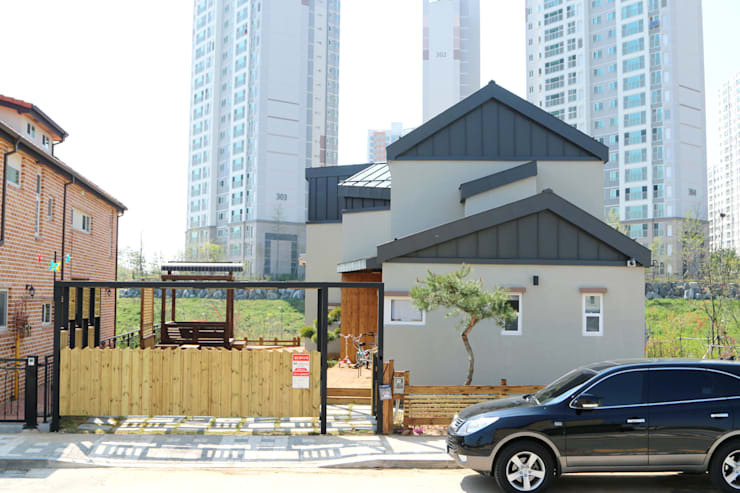 This Korean home was designed by the architects and designers at Wooden House. Using a timber frame construction, they've created this beautiful urban home that's filled with warmth and playfulness both inside and out (and it's worth noting that the company has received a 5-star rating for Quality Certification in Wooden Building Design). They began with quite a large plot of land, and on it they built a family home with a total floor area of 135 square meters. 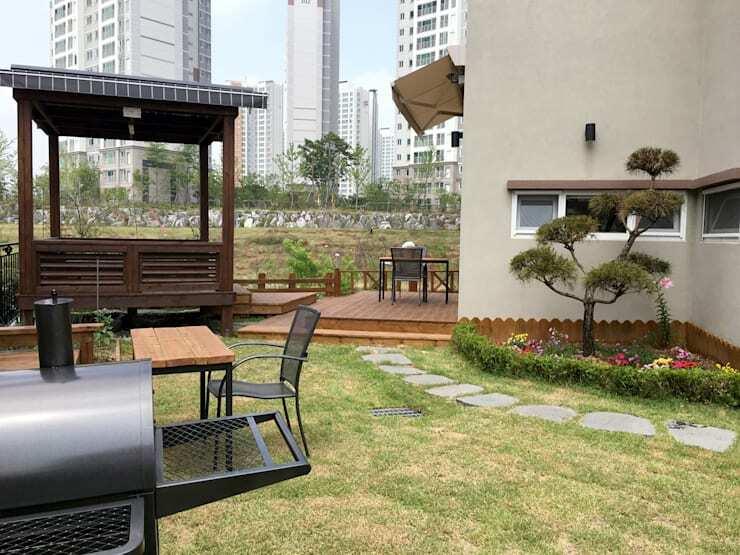 With most of Korea's population living in high-rise apartment buildings, this amount of land is quite the luxury – this family can count themselves among the few in this city that enjoy so much floorspace! 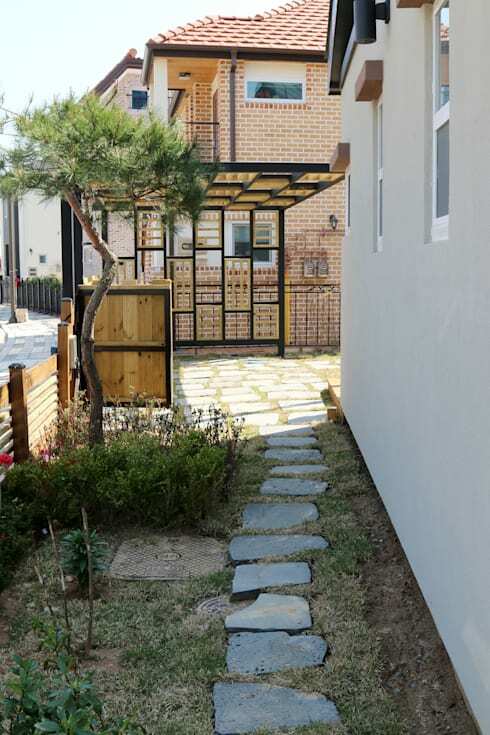 And while Korea tends to boast larger apartment sizes that than of its neighboring countries, this home still offers a good chunk more than the average Korean living space. It's time to explore this spacious wooden home! This charming, low-profile house seems somewhat out of place amongst the soaring skyscrapers that sprout up behind it! As you'll see during your tour of the home, this private space maintains a close connection to nature through a green yard and crop of small trees, creating a feeling of relaxation and playfulness that's totally unexpected in this urban landscape. Right away, you can glimpse a hint of this home's playful attitude in the the way the designers have installed a unique geometrical pattern in the block of cement that make up the home's driveway – keep your eyes out for more of these playful patterned additions throughout the family home! This view shows an interesting juxtaposition of blocky, man-made shapes against the curvy, organic lines of nature. The traditional typology of rectilinear forms with gable roofs is given a contemporary edge through the use of modern materials, from the red cedar porch to the zinc roof cladding that seems to form little hats on each mass of the home. Below, an organic cobbled path leads up to the garden-facing deck. What is modern and edgy above fades away below to let nature take the spotlight, with a tidy garden nestled into a recessed corner of the structure. Although the home is brand new, this natural feature brings a sense of establishment and harmony with its natural landscape. Inspired by this garden path? Make your own! Here's an ideabook with 8 garden paths that are do-able on a small budget. Perhaps the aspect that's most stunning in this home's design is the way it juxtaposes its open space in clear contrast to the cluttered cityscape beyond – no high walls have been erected, no latticed terraces, this yard provides playful green space against a backdrop of steel. A pergola sits on a warm wooden deck, transporting you to a countryside escape, while glassy blue and silver buildings fill the vista. It's a highly unlikely view, and it makes this family home all the more unique! Because it's always worth noting when a home enjoys the addition of a BBQ. There's no question when it comes to priorities – this family likes to enjoy time outside, as evidenced by the various decks, chairs, picnic table, BBQ – and even children's bikes – that populate the outdoor area of this home. It's not every day a car gets such a royal treatment. For most homes, the garage is an afterthought. Here, the sheltered parking area is just as stylish as the main structure, featuring an array of golden transparent glass arranged in thick square frames. This structured, blocky shelter offers a fun contrast to the rounded edges of the stepping stones scattered beneath, making for an artistic parking space that reflects both natural and man-made patterns. These designers can't get enough of the energy and interest that geometrical patterns create! 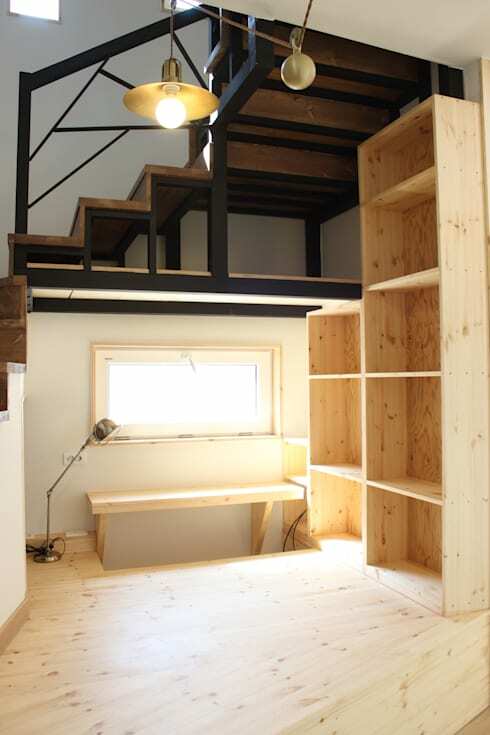 Here, a convenient reading nook is nestled under the folding stairs, flanked by large square cubbies that will offer generous storage space for kids' projects and materials. The rectangles and straight lines of this space create a highly dynamic and diverse space that's filled with a mixture of materials, from black metal railing to unstained wood to darker polished wood in the stairs. This living room is absolutely beautiful – simple, convenient, bright, and cheerful! 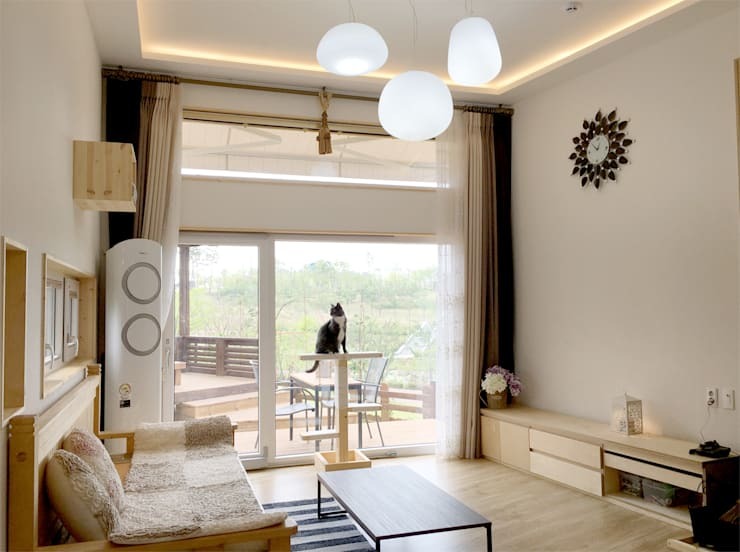 The arrangement of large window plus glass door plus fan light above has rendered an entire wall in glass, bringing plenty of light into the living area (and once again, you can see how this family prioritizes having quick access to the outdoors!). The furniture is simple, elegant and has that Scandinavian charm that everyone in the world has come to love. The kitchen opts for clean rational lines but doesn't shy away from a little pattern, colour and texture. The sleek black and white cabinetry is accompanied by a unique table that appears to wrap around the kitchen island, incorporating itself into the otherwise black-and-white kitchen in a visually interesting way. The stone tiling applied to the back wall is also a strong feature that completely changes the appearance of the space, gifting it a more industrial, urban feel. 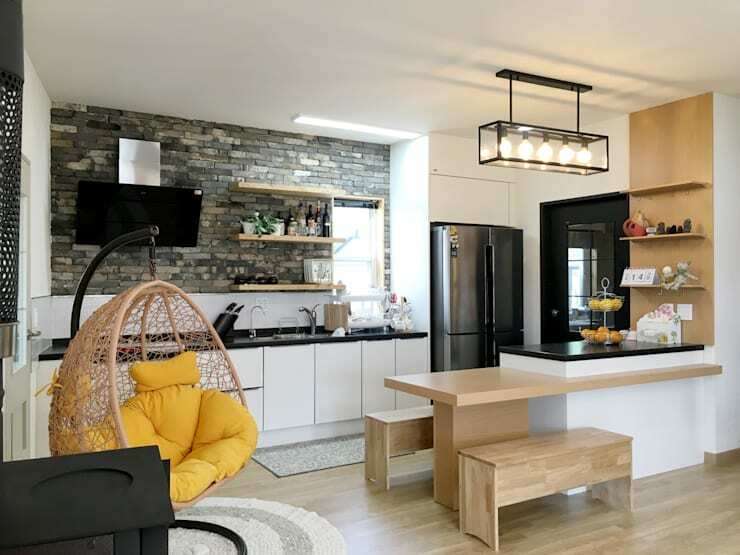 Add the pops of colour and light in the hanging yellow chair and glowing bulbs, and you've got a dynamic kitchen with a little bit of everything. This family maintains a focus on creativity and fun, especially in their kitchen! If this fun design has got the wheels turning, check out this ideabook with 7 Thrifty Ways to Redecorate Your Kitchen. This home is ready for family living. 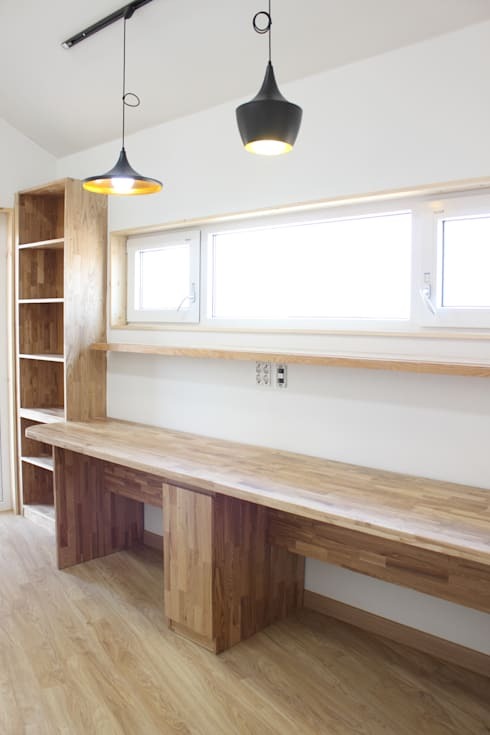 Here's an example of the space before being furnished – this convenient workspace offers floor-to-ceiling storage shelves, a long bench worktable, and shelf that lines the long, horizontal window. Well-lit by both natural light and a mismatched assortment of hanging lamps, this space is a convenient and accessible work space for all members of the family. What do you think of this stylish family home? Comment below!